Further information: I got this and another jade pencil pot when I was in Shanghai a few years ago. Compared to other pencil pots it is unusually heavy and the walls and base of the pot are rather thick. I assume this one was supposed to be used for a brush (because of its tall, slim shape). Shaped like a bamboo stem! Yes it should be very heavy, but lovely nonetheless! 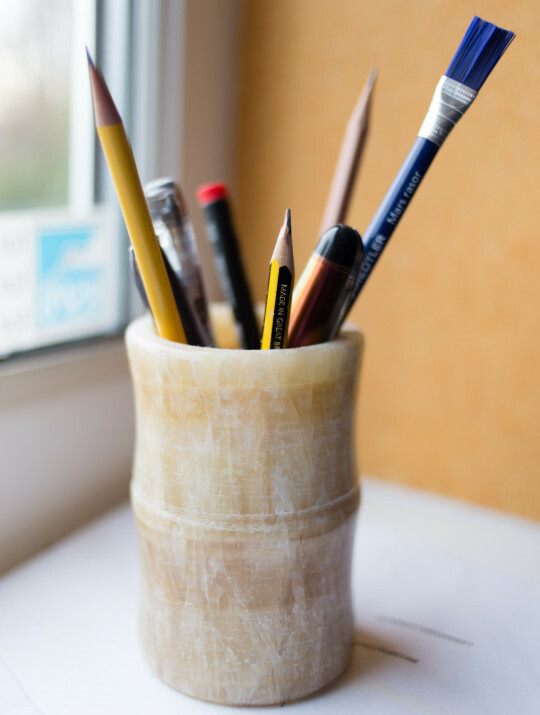 It is a nice pencil pot, but the tall shape and thick walls mean that you can’t store a lot inside. The other jade pencil pot is more practical, but this one maybe a tick better for pencils. Pingback: Just another pen ? !Blick über den Tellerrand vom 26. December 2015 - Just another pen ?! ← Pencil to the rescue!